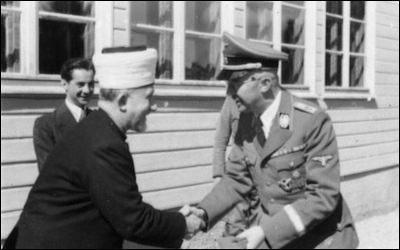 The Jerusalem mufti, Muhammad Hajj Amin Husseini (left), meets with SS-Reichsführer Heinrich Himmler, April 1943. 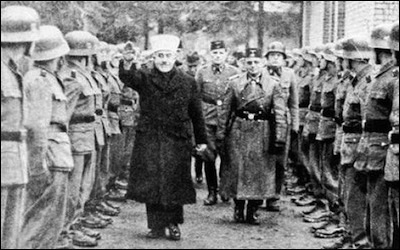 The Jerusalem mufti, Muhammad Hajj Amin Husseini, leader of the Palestinian Arabs from the early 1920s to the late 1940s, is widely known for his close collaboration with the Nazis during World War II. Aspects of the collaboration remain to be more thoroughly scrutinized. However, and without discounting his culpability for the collapse and dispersal of Palestinian Arab society (or al-Nakba, the catastophe, as it is called by Palestinians and Arabs), Hajj Amin's role in shaping Muslim perceptions of Jews might be a far more important and lasting legacy than his political activism in Palestine, Germany, or elsewhere. An important source supporting this fact is a booklet he authored for Muslim soldiers enlisted in the Nazi SS division in Bosnia. During the mufti's stay in Berlin in 1941-45, he befriended Hitler's right-hand man, Reichsführer-SS Heinrich Himmler. Himmler's fascination with Islam and the mufti's zealous support for the Nazi cause resulted in several common enterprises, notably the establishment of a volunteer Waffen-SS division in Bosnia, made up mostly of Bosnian Muslims, later named the Handzar division. Most books about the division display photographs of its soldiers—distinguishable by its insignia on uniform lapels and fez headgear—reading a booklet titled Islam und Judentum—most certainly the German version of the mufti's Croatian or Bosnian pamphlet Islam i židovstvo (Islam and Judaism). In whatever language the pamphlet was originally written, the intended readers were Muslims (Bosnian or otherwise) and not Germans. This author has been unable to locate a German copy of the pamphlet, but it is reasonable to regard the text written in the language of the Bosnian Muslims (at the time called Croatian) as the most relevant. A translation of the booklet is presented below, followed by an analysis of its significance and far reaching implications. For us Muslims, it is unworthy to utter the word Islam in the same breath with Judaism since Islam stands high over its perfidious adversary. Therefore, it would be wrong to carry out comparison of those two generally different counterpoints. "Islam stands high over its perfidious adversary [Judaism]." Unfortunately, it is insufficiently known that animosity between Islam and Judaism is not of a recent date. It reaches long back in history, all the way to the time of the Prophet Muhammad. This short historical overview will demonstrate the importance and perfidiousness of Jewry and its animosity toward the founder of Islam, the Prophet Muhammad. and insufferable stance toward the nations that offered them hospitality, and toward their neighboring nations, are the reason that those same nations had to resort to [certain] measures in order to suppress a Jew's efforts to obtain his desire by force. The history of antiquity shows us that the pharaohs were already forced to use all means against Jewish usury and Jewish immorality. Ancient Egyptians finally expelled the Jews from their land. Led by Moses, the Jews then arrived in the Sinai desert. Arab theologian Muhammad ibn Jarir al-Tabari [839-923 C.E.] narrates that the Jews even wanted to kill their leader and savior Moses when he came back from Mount Sinai. Because of that, God punished them, and they had to meander in the wilderness for forty years. It should have brought them to their senses, and the new generation should have been cleansed from the low esteem of their fathers. Following that, the Jews spread like locust all over the Arab peninsula. They came to Mecca, to Medina, to Iraq, and to Palestine, which is the land of milk and honey. The group of the Jews that came to Syria and Palestine was now under Roman rule. The Romans, however, soon discerned the peril that threatened the land from the Jews, and so they introduced harsh measures against them. Besides that, a serious, contagious illness of plague erupted, which was by common opinion brought into the land by Jews. When even medical doctors stated that the Jews were indeed the source of the infection—and their opinion was obviously correct—there arose among the people such upheaval against the Jews that many Jews were killed. In addition, that event is the reason why the Jews have been called "microbes" in Arabia to this very day. The mufti of Jerusalem, Muhammad Hajj Amin Husseini, visits the volunteer Nazi Waffen-SS division in Bosnia, made up mostly of Bosnian Muslims. The mufti was instrumental in the division's formation. The Arabs have a particular understanding for introducing forceful measures against Jews in Germany and for their expulsion from the country. After the [First] World War, England and America enabled the Jews to settle in Palestine and to establish a Jewish state there. Jewish excrement from all countries assembled there, rascally striving to seize the land from Arabs. And indeed, they succeeded in buying land from the poorest of the poor and from unscrupulous landlords. By doing so, they took poor widows' bread and stole food from children to fatten themselves. When the Arabs opposed the Jewish settlement, the Jews did not shun bloody murders. So they robbed many families of their livelihood and threw the families into misery and troubles. (God will punish them for those disgraceful deeds). The Jewish struggle against Arabs is nothing new for us, except that as time passed, the location of the battlefield changed. Jews hate Muhammad and Islam, and they hate any man who wishes to advance the prosperity of his people and to fight against Jewish lust for possessions and Jewish corruption. Struggle between Jews and Islam began when Muhammad fled Mecca to Medina where he created the base for the development of Islam. At that time, Jews were merchants, already permeated with guile, and they understood that Muhammad's influence, in both the spiritual and business spheres, could turn into a danger for them. Thus they were possessed by a deep hatred toward Islam; hatred that intensified as Islam was growing more solid and powerful. The Jews breached the agreement they had concluded with Muhammad in Khaibar, of which we shall speak later. Moreover, their rage grew immensely when the Qur'an revealed the deepest inclinations of their soul, their heartlessness, and unscrupulousness by which their ancestors had been commonly known. At that time, the Jewish methods were already the same as they are today. Their weapon has been, as always, slander and quarrel, and so they attempted to humiliate Muhammad in the eyes of his followers. They claimed that he was a deceiver, an enchanter, and a liar. When they did not succeed in this, they attempted to undermine Muhammad's honor by spreading a rumor that his wife Aisha committed adultery. The purpose of spreading such a rumor was to sow doubt in the hearts of Muhammad's followers. Many of those knowledgeable in the Scriptures attempt to somehow render you infidels again by converting to our religion. It was, though, nothing but their souls' envy, when they comprehended truth. When the Jews understood that they would not reach their goal by the means used until then, they started to ask Muhammad various meaningless and unsolvable questions. Thus, they wanted to convince others that Muhammad was poor in knowledge and wisdom. However, that method achieved no success. As they were thus persuaded that Islam was deeply rooted in the hearts of the Muslims, they commenced with the attempts to destroy the Muslims. Pursuant to that goal, they paid some non-Muslim tribes to fight against Muhammad. The almighty God, however, wanted it differently. With iron fist, Muhammad defeated the rebellious tribes and conquered their city. The Jews could not bear such a defeat, and so they decided to destroy Muhammad in every way. They hired men to murder him. "God ... warned [Muhammad] ... so the treacherous Jews could not carry out their design." The Medina Jews lived in the city district of Banu Nadir. When Muhammad came to Medina, he concluded a contract with them. One day he set out to that city district, accompanied by only ten companions, to talk to the Jews and to try to convert them to Islam. Muhammad explained the principles of Islam to the Jews, and they seemed very interested and open-minded. Yet as Muhammad was talking in a friendly way with some of the Jews, another group prepared an attempt on his life. They persuaded a man to throw a piece of rock on Muhammad's head. Surely Muhammad would have been killed were it not for God, who warned him. An inner voice advised him to leave that place, and so the treacherous Jews could not carry out their design. Consequently Muhammad sent a companion to deliver his message to the Jews to leave the city within ten days. They had breached the contract they concluded with him by trying to take his life. Any Jew found in the city after those ten days would be punished by death. However, some of the Jews, who outwardly accepted Islam but in their innermost remained Jewish, persuaded other Jews not to leave the city. When the ten days passed, Muhammad was forced to expel the Jews from the city by armed force. Part of the Jews fled to Khaibar and part to Syria. The Jews who fled to Khaibar, however, would not concede defeat and decided to avenge themselves on Muhammad. For that purpose, they turned to other Khaibar Jews and to the Jews of Taima and of Wadi Qura. Together they plotted a conspiracy: With large sums of money, they agitated non-Muslim Arab tribes to attack Medina. When Muhammad discovered their plan he quickly armed his men and set out toward the plotters' base in Khaibar. Muhammad's companions captured Khaibar and expelled most Jews from the site. With the remaining Jews, Muhammad concluded a contract by which peace was guaranteed. Only after that devastating defeat [of the Jews] could an Islamic Empire peacefully develop. But when one takes into account the Jewish significance, it was not to be wondered that Jews, in spite of the agreements made, did not abandon their plans and continued to try to destroy Muhammad by all available means. They invited him to a feast, and he accepted the invitation suspecting no evil. In front of him was placed a roasted lamb prepared by the Jewess Zainab, wife of Sallam ibn Mishkam. The [topic of] conversation around the table was the contract and a peaceful life in mutual agreement in which they now lived. Muhammad had not the slightest suspicion about treason. The Prophet and his faithful companion Bashr ibn Bara each took a piece of lamb meat. Muhammad, however, did not swallow his bite because its taste made him suspicious. "The bone tells me that the lamb was poisoned," he said and called the Jewess Zainab to ask whether the meat had been poisoned. She answered, "You know I am highly esteemed by the Jews, and I acknowledge that I have poisoned the lamb. In so doing, I thought that if you were a king, I would only kill a king, but if you were indeed a prophet, you would know that the meat had been poisoned." Muhammad's companion soon succumbed to the poison's effect, whereas Muhammad, despite spitting the poisonous bite, later suffered various health disorders, and the impact of the poison had always been evident. Some historians even believe that Muhammad's death was a consequence of that poisoning. In this matter, they refer to a hadith by Abu Huraira, whereby the Prophet said shortly before his death, "The effect of Khaibar's feast will manifest in me until I die!" 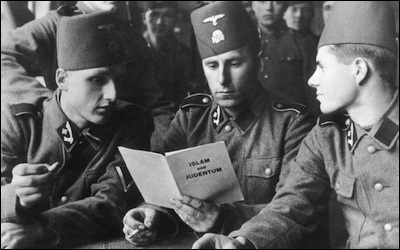 Many books about the Waffen-SS division in Bosnia display photographs of its soldiers reading a booklet titled Islam und Judentum—most certainly the German version of the mufti's Croatian or Bosnian pamphlet Islam i židovstvo (Islam and Judaism). 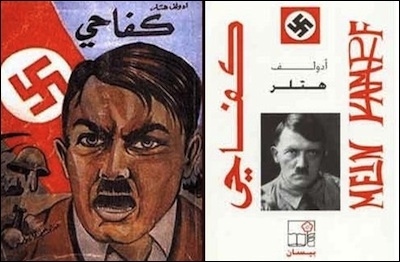 The booklet offers a stark illustration of the lengths taken by the mufti to demonize Jews and Judaism and clearly was produced for propaganda and incitement purposes. We, the Muslims, must always bear in mind the Khaibar feast. If the Jews betrayed Muhammad in such a way, why wouldn't they treacherously persecute us today with the purpose of destroying us?! entered the city. In this regard, the Jews tried to undermine the Islamic empire. A revengeful old man by the name of Shas ibn Qais one day walked with his friends and came across an assembly of the reconciled tribes held in city square. He could not bear to see how [the members of] those two tribes, formerly at war with each other, now communicated nicely, and so devised a hellish plan. He sent to their assembly a friend of his, knowledgeable in war poems, and persuaded him to recite some of his old poems that were full of hatred. That Jew, an outstanding orator, came indeed to the assembly and started to recite old war poems of both tribes. By doing so, he managed to find in each tribe a man in whom old hatred flared up. Those two men started to fight each other and then urged their fellow-tribesmen to take up arms. An immense tragedy would have ensued were it not for Muhammad, who learned about the fight amongst brethren and hurried up to the battlefield. "Oh my God, are the old times returning even while I am still amongst you!" he shouted. "When I gave you Islam as religion, the old fratricidal discord was buried, and you became brothers in your hearts. Do you wish to slip into infidelity again?" Oh, you scribes, why do you prevent the believer from walking on God's path when you are witnesses yourselves? But God is not blind for what you do. Oh, you who believe, would you listen to those who received the Scripture, so that they would turn you into unbelievers again, after you have received faith! How can you be infidels when God's words were read to you, and his apostle is among you? He who holds unto God has already been introduced to a straight path. "The Jews never succeeded in spreading division among Muhammad's followers." Notwithstanding their attempts, the Jews never succeeded in spreading division among Muhammad's followers and in dragging them back into infidelity. However, even after all these events should have taught them the futility of their efforts, they persistently continued to carry out their devilish plans. Once, they tried by deceit to even bring down Muhammad himself. Be careful to make decisions according to what God has revealed and not to consider their desires. Keep your guard toward them so that they would not even partially shift you from what God has revealed to you. If they rebel, know that God will surely punish them for a part of their sins. There are, indeed, many men who are evildoers. We see how you turn your face toward heaven, and we would like to give it a direction which you will like: Turn your face toward the holy place of prayer; wherever you find yourselves, turn your face in that direction. Don't you see that even those who had received the Scripture know that it is the truth before their Lord? And God is never heedless of what they do. The direction to which you used to turn in prayer until now we have changed only for the purpose of distinguishing those who follow apostles from those who turn on their heel. That was surely difficult but not for those led by God. And God does not want to destroy your faith because God is full of goodness and compassionate to men. Here is another example how the Jews did not hesitate to stab Muhammad in the back at the time of his utmost distress. When Muhammad won the Battle of Badr, he sent a messenger on his own camel, because that camel was the fastest, to carry the news about his victory to Medina. The Jews, however, tried to bring confusion into the Muslims' ranks by spreading false rumors that Muhammad had been killed in the battle. As evidence, they pointed out that Muhammad's camel returned to the city with another rider. Don't you see those who received the Scriptures? They believe in Jibt and Taghut [superstition and idolatry], but they nevertheless say about pagans that their way is better than believers' way. Those are the ones whom God has cursed, and he who was cursed by God cannot be helped. You will certainly find out that the greatest animosity toward the believers foster the Jews and the pagans. Judgment Day will not come before the Muslims completely destroy the Jews, and when every tree with a Jew hidden behind will say to the Muslim, "There is a Jew behind me, kill him!" Only the gharqad tree, which is a small bush with many thorns growing around Jerusalem, will not participate in it because it is a Jewish tree! [Bukhari-Muslim VIII, p. 188]. The booklet Islam and Judaism offers a stark illustration of the lengths taken by the mufti to demonize Jews and Judaism. Qur'anic passages are freely paraphrased without reference to sura and verse while apparent quotations (like those about Jews converting insincerely to Islam in order to drag Muslims away from their faith) are nowhere to be found in the Qur'an, certainly not in the translation by Muhammed Pandža and Džemaluddin Čaušević used by Yugoslav Muslims since 1937. Indicating the pamphlet's clear propaganda and incitement purpose, this sloppiness reflected both Hajj Amin's poor religious credentials and his apparent conviction that the pamphlet would not be subjected to critical scrutiny or even read by believers well-versed in the Qur'an. For, though bestowed with the title of Grand Mufti of Jerusalem, Mandatory Palestine's highest religious authority, it was common knowledge at the time that Hajj Amin did not possess the necessary religious credentials for such a lofty post. Indeed, he even failed to make the final short-list for the mufti's post having received only nine of the electors' sixty-four votes; but the Husseinis and their British champions forced one of the final three candidates to step down in his favor, paving the road to his appointment. Though given the title of Grand Mufti of Jerusalem, Hajj Amin did not possess the necessary religious credentials for such a lofty post. Some of the pamphlet's assertions indicate the mufti's deficient familiarity with Islamic history and theology. Nor was Hajj Amin averse to introducing novelties and fabrications for the purpose of defaming Jews. His text contains details with an unconventional interpretation of Qur'anic accounts, some of them erroneous. He accuses the Jews of having "attempted to undermine Muhammad's honor by spreading a rumor that Muhammad's wife Aisha committed adultery." But renowned Islamic scholars, including Tabari, to whom the mufti refers in the booklet, do not mention the Jews at all in the context of this event: Aisha's accusers were all Arabs. Some came from the tribe of Kharzaj; at least one was from the Quraish, Muhammad's tribe, and another was the sister of Muhammad's wife. Their names are listed in both Ibn Ishak's and Tabari's accounts of the event. After God revealed Aisha's innocence to Muhammad, some of the accusers were punished by flogging. Furthermore, the mufti claimed that Muhammad attacked Khaibar because its Jews bribed Arab tribes to attack Medina. The sources, however, do not mention any such activity by the Khaibar Jews. Khaibar was in alliance with the Arab tribe of Ghatafan—which at this point seemed to be rather defensive—with the Quraish, and with the Persians. Muhammad's attack occurred shortly after he concluded the peace of Hudaibiya (March 628) with the Meccans. It is hard to envisage that Muhammad's enemies would plot an attack from the north without Meccan support. On the contrary, it seems that he concluded the peace of Hudaibiya to secure his southern front so as to be able to attack the Khaibar Jews, whose Persian allies had just been defeated by the Byzantine army. There remains a deep connection between Islamism and Nazism based on the common characteristics of racism, nationalism, religious bigotry, and intolerance. Hitler's Mein Kampf has been a bestseller for years in predominantly Muslim countries, including the Palestinian Authority and Turkey. the Banu Quraiza with that of Muhammad's war on Khaibar. Far more important than these technical details and idiosyncratic interpretations are the novelties the pamphlet introduces in Islamic political discourse regarding the Jews. By combining the Islamic canon with pre-Christian and Christian anti-Judaism, it attributes strengths and powers to Jews that cannot be found in Islamic tradition by portraying them as far more cunning and successful in their vicious designs than previous mainstream Islamic thought had recognized or permitted. The pamphlet portrays Jews as far more cunning and successful in vicious designs than previous mainstream Islamic thought. A simpler example of this anti-Jewish eclecticism can be found in the mufti's accusation that Jews brought plague to Arabia. This statement evokes medieval European myths with similar themes. More significant is the notion that Muhammad's death might have been a result of poison given to him by a Khaibar Jewess. To be sure, Ibn Ishak and Tabari do mention how during the illness that led to his death Muhammad spoke to Umm Bashr, mother of his poisoned companion, and complained about his pain, caused by poisonous meat he had tasted three years earlier. However, in classic Islamic thought, this tradition was not interpreted as proof that the Jewess had succeeded in her attempt on the Prophet's life but as a desire to attribute to the Prophet the highest of virtues: martyrdom. In Ibn Ishak's words, "The Muslims considered that the apostle died as a martyr in addition to the prophetic office with which God had honored him." Tabari repeats this explanation, as does Ibn Kathir (1300-73), who referred to eight different hadiths asserting that Muhammad had been warned by God about the poison: proof of his being a genuine prophet. Conversely, Ibn Kathir states that "the Messenger of God died a martyr." The core theme of all these traditions is the Prophet's martyrdom and not the Jews' lethal craft; the reader is left with the clear impression that the two phenomena were unrelated. In contrast, the mufti's pamphlet establishes the link and changes the emphasis from the Prophet's virtue to the Jews' mendacity. Apparently, his intention was to draw parallels with Christian traditions regarding Christ's killing by the Jews. This accusation was intended to provoke more anger among Muslims, but it also violated Islamic tradition and theology. The implications of the mufti's claim that the Jews were successful in killing Muhammad despite God's warning imply that Jews possess the power to defy God's will. Such a blasphemous thought would be worse than Christian accusation of deicide. Jesus overcame death, and by his suffering, death and resurrection brought salvation to his community of believers; however, Muhammad not only remained dead but also failed to appoint his successor due to the rapid progression of his illness and his sudden, untimely demise. Consequently, the umma was split by different claimants to authority, and the dispute eventually led to the fiercest internecine strife in the history of early Islam, known as the fitna. The outstanding characteristic, therefore, of the Jews as seen and as treated in the classical Islamic world is their unimportance. ... For Muslims, he might be hostile, cunning, and vindictive, but he was weak and ineffectual—an object of ridicule, not fear. This image of weakness and insignificance could only be confirmed by the subsequent history of Jewish life in Muslim lands. Departing from this conventional view, the mufti did not interpret contemporary events as a new historical phenomenon to which Muslims should respond in a new, ad hoc manner. Instead, he traced Jewish accomplishments of the 1920s, 1930s, and 1940s, and the alleged Jewish power and ambitions, to supposed Jewish activities at the time of Muhammad. In doing so, he created a precedent, later followed by prominent Islamic actors in the Middle East and elsewhere, particularly after Israel's stunning military victories over its Arab adversaries. Thus Hamas accuses the Jews of "wiping out the Islamic caliphate" by starting World War I and of starting the French and the communist revolutions, establishing "clandestine organizations" and financial power so as to colonize, exploit, and corrupt countries. Likewise, former Malaysian prime minister Mahathir Muhammad accused Jews of ruling the world by proxy. Attributing such gargantuan accomplishments to the Jews, many of them at the expense of Muslims, presents a theological innovation with an immediate political consequence. Linking early Islamic with medieval Christian depictions of Jews results in their portrayal as "a demonic entity," thus making their "extermination legitimate." Boris Havel holds an M.A. in comparative religion from the Hebrew University of Jerusalem and Ph.D. in international relations and national security from the University of Zagreb. He works at the Croatian Ministry of Foreign Affairs and teaches at the Biblical Institute, Zagreb, Croatia. His most recent book is An Overview of the History of Israel: From Abraham to the Modern State (Izdanja Antibarbarus, 2015). Klaus-Michael Mallmann and Martin Cüppers, Nazi Palestine: The Plans for the Extermination of the Jews in Palestine, trans. Krista Smith (New York: Enigma Books in Association with the United States Holocaust Memorial Museum, 2010), p. viii. Boris Havel, "Haj Amin al-Husseini: Herald of Religious Anti-Judaism in the Contemporary Islamic World," The Journal of the Middle East and Africa, 3 (2014): 221-43. The following text has been translated from the original pamphlet: Veliki Muftija Jeruzalemski Hadži Emin el-Huseini, Islam I Židovstvo (Zagreb: Hrvatski tiskarski zavod, 1943). I wish to thank the staff of the National and University Library in Zagreb for tracing the booklet. The Qur'anic verses and hadith are translated as they appear in the original text. The word "prostačkoj" can also be translated as: obscene, dirty, or indecent. This word was written in singular in the original text and introduces the notion that the average Jew was such; by referring to "a Jew," the author refers to the whole people. The mufti fails to note that prominent members of his own family, including his father, were among the "unscrupulous landlords" selling plots of land to the Jews. See Efraim Karsh, Palestine Betrayed (New Haven: Yale University Press, 2010), pp. 15-19. Ibn-Ishak, The Life of Muhammad: A Translation of Ibn Ishaq's "Sirat Rasul Allah" by A. Guillaume (Karachi: Oxford University Press, 2004; repr., 1967), p. 516; Tabari, The History of al-Tabari [Ta'rikh al-Rusul Wa-l-Muluk] (New York: State University of New York Press, 1987-97), vol. VIII, pp. 123-4.- Ed. The author probably refers to the Arab tribes of Aws and Kharzaj though the transliteration (Kauša i Karaša) barely resembles those names. The word "pismenjaci" refers to the "People of the Book" (sljedbenici knjige in Čaušević-Pandža). There is no Qur'anic verse with this message. The mufti perhaps refers to a non-canonical hadith or obscure tradition. Muhammed Pandža and Džemaluddin Čaušević (eds. ), Kur'an, Sedmo Izdanje (South Birmingham: Islamic Relief, 1937-89). Though the Qur'an condemns those who falsely feigned Islamic belief (e.g., sura 2:8-9, or sura 63), this condemnation does not specifically apply to the Jews but rather to the wider category of "hypocrites." Karsh, Palestine Betrayed, p. 17; David Dalin and John Rothmann, Icon of Evil: Hitler's Mufti and the Rise of Radical Islam (New York: Random House, 2008), p. 252. Ibn-Ishak, The Life of Muhammad, pp. 492-9; Tabari, The History of al-Tabari, vol. VIII, pp. 57-67; Qur'an: sura 24:11-26. Michael Lecker, "The Hudaybiyya-Treaty and the Expedition against Khaybar," Jerusalem Studies in Arabic and Islam, 5 (1984), pp. 1-12. Ibn-Ishak, The Life of Muhammad, pp. 450-69. Tabari, The History of al-Tabari, vol VIII, p. 124. Ibn-Ishak, The Life of Muhammad, p. 516. Ibn-Kathir, The Life of the Prophet Muhammad (al-Sira al-Nabawiyya), trans. Trevor Le Gassick (Reading: Garnet Publishing, 2000-06), vol. 3, pp. 283-7. Palestinian Authority TV, Nov. 8, 2013; "PA: Arafat was poisoned by Jews like Islam's Prophet Muhammad," trans. Palestinian Media Watch, Nov. 12, 2013. Yehoshafat Harkabi, Arab Attitudes to Israel (Jerusalem: Israel Universities Press, 1972), p. 220. Bernard Lewis, Semites and Anti-Semites (London: Phoenix, 1997), pp. 117-39. See, for example, "Hamas Covenant 1988," Yale Law School Avalon Project, accessed Mar. 14, 2015. Moshe Sharon, Jihad: Islam against Israel and the West (Jerusalem: Moshe Sharon, 2007), pp. 77-8. Related Topics: Antisemitism, Muslims in Europe, Palestinians | Summer 2015 MEQ receive the latest by email: subscribe to the free mef mailing list This text may be reposted or forwarded so long as it is presented as an integral whole with complete and accurate information provided about its author, date, place of publication, and original URL.